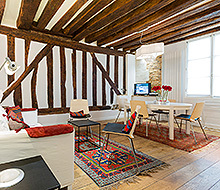 The moment you enter this divinely luxurious three bedroom two bathroom Paris rental you will feel as if you are royalty coming home to your palace. Cloaked in a grandiose elegance, and located just a couple of minutes walking from the Louvre itself, there is no better place in all of Paris for you to set down your suitcase and hang up your hat. The journey starts here. This delicate old building will give you a sense of history and the elevator is roomy enough to fit three people and their luggage- a rarity in Paris. But don’t stop here. Keep going. Open the door to your palace and you will be greeted by light and an elegant use of space that takes your breath away. Our Louvre Royal rental boasts a painstaking attention to detail that will guarantee your every whim is attended to. From the exclusive Frette linens and towels to the stunning chandelier in the master bedroom, this luxury apartment feels glorious, elegant and peaceful. Let’s start in the living room, which is so beautiful it looks like a painting. The pure white sofas juxtapose delightfully with the hardwood floors and taupe walls. Large picture perfect windows offer you views and the exquisitely antique furniture provides you with a place to indulge. The sofas face each other, creating the perfect nook for a cozy conversation or a glass of burgundy. Near the windows, the notable desk is a writer’s dream. A couple more steps and you arrive to the wooden expanding dining table (up to 8 guests) with its matching fabric covered chairs. Here you can enjoy your croissant and café au lait in the morning light. The windows are double paned, meaning that street noise is conveniently blocked out. You are just left with copious amounts of light. Notice the delicate lighting fixtures, the well-placed mirrors, and the plasma television which has hundreds of channels. 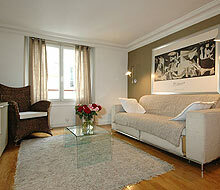 Additional chairs, a glass coffee table and Japanese art will make this an essential room in your Parisian palace. The master bedroom speaks to you in the continued floral theme on the splendid Queen bed, chair and the sturdy-yet-feminine curtains. Small wooden bedside tables with individual lamps are perfectly placed on either side of this enchanting bed. The room contains a large wooden wardrobe and various mirrors and framed Japanese paintings. The chandelier, like a flower blooming above the bed, is spectacular. The master bedroom has a gloriously mirrored en-suite bathroom. This bathroom contains a marble shower/tub, WC and vanity. The second bathroom in the apartment contains a shower, WC and sink. Here in the bathrooms you will find that the sophisticated details continue with golden fixtures and taps. The second and third bedrooms are quite versatile. The second bedroom is equipped with two single beds that can be easily pushed together to form a Queen if need be. The third bedroom, however, has a 2 single beds perfects for kids. And both rooms are, thanks to floor-to-ceiling windows, quite luminous. Personal belongings can be stored in the provided wardrobes and built-in shelving. The kitchen in the Louvre Royal is state of the art and fresh. Not only are all the appliances in this kitchen new: two ovens, a microwave, refrigerator, freezer, dishwasher, nespresso machine and washer/dryer; but this kitchen really offers up the perfect amount of space and the proper atmosphere to properly enjoy the amenities. Here you will find hardwood floors and an additional glass dining room table which seats up to six. We had a three generation, six women, Paris trip in July-August 2018 and stayed at the Louvre Royal. It was a fantastic experience. The location cannot be beat. 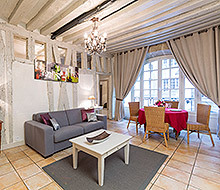 We could walk to any of the attractions, were around the corner from a few wonderful Plazas and just a 10 minute walk from the shops of St. Honore and Marais. We also had no problem getting ubers to anywhere we wanted to go. There are restaurants everywhere. The food is wonderful. Christine comes every day and tidies up and takes out the trash. She spoke english, had a fantastic smile and was very accommodating to our schedule. Patrick was a great source of information about tours and arranged pick up and drop off at the airport and train station since we had so many and a regular taxi or uber would not work. I would highly recommend the Jules Verne restaurant and trip to the summit on the Eiffel Tower, the Seine river dinner cruise, the Louvre skip the line VIP tour and the Epernay tour to get out of Paris and sip some champagne. Everyone we met was welcoming and funny, not at all like the stereotypical Parisian. The only complaint we had really was more about the incredibly hot weather than the apartment. Normally I am sure the fans and air conditioners provided would be more than adequate but the temperatures during our 12 day stay topped 30 C. The small room with two twin beds needed to have the windows open for a cross breeze along with two fans. This is a busy street so in the morning the traffic starts. Also, two nights we had people on the street yelling at each other. It was actually pretty funny and I think unusual because you could see the residents looking out their windows watching. I kept thinking in NYC there would be a lot of yelling at the people on the street to "shut up" :). The apartment is beautiful, elegant and spacious. Way more than you would get for the same price at a hotel. The kitchen is well appointed. We used the washer but the dryer is really just to get the drying started. Mainly we used the drying rack in front of an open window. By morning everything was dry. Don't miss out on this great opportunity. Cannot wait to come back.